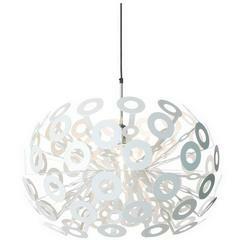 Suspension lamp with diffused and direct down light. The opaque epoxy powder varnished steel spokes are attached to the upper part by two ABS/polycarbonate discs and to the lower part of the aluminium module that acts as the housing and heat sink for the two LED boards. The electric cable that powers the boards is invisible, because it is housed in one of the spokes. The suspension cable is in stainless steel and the electric cable is transparent. The ceiling rose and zinc-coated metal bracket has a shiny white batch dyed ABS covering. Materials: Varnished steel and aluminum. Light source: LED 38.2W. Color: White. Made up of a sequence of interconnected geometric shapes, the Welles Central chandelier forms sculptural and organic shapes to create a unique silhouette.